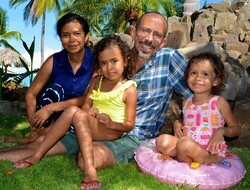 Mark and Jenny are currently serving with Famer’s Movement of Papaye (MPP) and the Evangelical Dominican Church. Mouvman Peyizan Papay (MPP) is a grassroots movement whose goal is to help small farmers improve their living conditions. Mark works with members, advising them on ways to increase food production and his work helps farmers provide adequate nutrition for their families and generate income by selling excess crops. This and other productive practices developed by MPP helped rural Haitians feed family members and friends who fled to the countryside after the 2010 earthquake devastated Port au Prince. The Evangelical Dominican Church operates a community health program in company towns where sugarcane workers live. Jenny helps the Church with their health clinics and with the development of its program to train health care leaders. Jenny grew up in her home country of Nicaragua. Both had pastors for fathers. Mark has been with MPP in Haiti since 2004. Jenny joined as a volunteer just after their marriage in 2008, and in 2012 crossed over the border to continue her mission in the Dominican Republic. They have two daughters, Keila and Annika.